Sometimes we will be busy, so if the phone is not answered immediately, you can always leave a message with your contact number and a member of the Customer Service team will ring you right back. We endeavour to answer all emails within 48 hours not including weekends. If you have an issue with any product – for example missing or broken parts, providing the following details when emailing the Customer Service team, will let us resolve your problem faster. 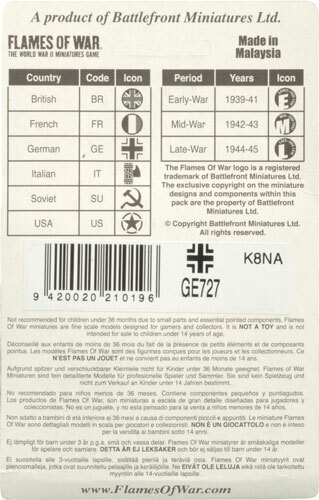 Left: An example of a Packer Code (K8NA) on the back of a blister pack. Right: An example of a Packer Code (K6D) from a box set. The store's contact person, or who you spoke to. When you email, a ticket is created in our customer service system. We check tickets Monday–Friday in both our UK and USA offices first thing in the morning. So if you send an email on Tuesday afternoon, it will be seen on Wednesday morning. Questions will be answered by a customer service agent. Our customer service agents only actively look for customer service issues through this system, so if you report an issue elsewhere (Facebook, Twitter, forums etc.) although we still want to help you, there is no guarantee it will be attended to in a timely way. We may send you a customer service help form to fill out, if we need more information before we can resolve your issue. Depending on your location, replacement parts may be shipped by UPS, Fed-Ex or postal service. We try to resolve issues within 14 days, but replacement parts may take longer if parts are not currently available.